Well if that news does not put you into a panic, I do not know what will. I remember leaving the gynecologists office with a lump in my throat not being able to talk and I guess a lump in my breast too. I keep sticking my hands down my bra, feeling around my breast trying to find what Dr. Garcia found. A small something? What does that feel like? Why can’t I feel anything? Okay I need to get my kids and will deal with this in a few hours. I kept saying to myself, “I’m sure it’s nothing, I’m 34, and I’m healthy. WHO ARE YOU GOING TO CALL? Ghostbusters? No, although, I wish at that moment they could help. I went straight to everyone’s dear friend, GOOGLE, and started calling around locally to schedule this mammogram. Now, knowing it was NYE, there was no way a doctors office was squeezing me in. The few places I called no openings until the END of January. I kept thinking to myself I couldn’t wait a month, what if it’s something serious. Then I called Akumin Elite Imaging in Plantation, Florida. First, I have to tell you, the office Manager Denise, was just a ball of fresh air. If I could adopt her to be my Italian mother, I would. Warm as can be, friendly, understanding and as real. She was such a pleasure to work with and felt as though we were in this together. She was able to find me an opening! On January 5th I met with the amazing staff who was going to do my images and biopsy. I went in for my first scan and they confirmed what Dr. Garcia had found. The technician, Rhonda was extremely knowledgeable and kind while calming my fears. We then met with the Diagnostic Radiologist Dr. Ballard, who was more than professional; he was very personal and patient while explaining everything. He wanted us to get the biopsy that day and said to come back after lunch. My husband and I barely ate soup and feared for the worst. After the biopsy, Dr. Ballard explained to us our next steps and what doctors to be seeking out. Our phones didn’t stop calling to get an appointment for a breast cancer surgeon specialist, which lead us to Boca Regional Hospital with Dr. Robyn Moncrief. Had I known that the hospital was an amazing resource, I would have went here right away! Five star reviews all around. The staff, the facility and overall experience is just more than comfortable. Once I decided to use Dr. Moncrief and her staff at Boca Regional for my cancer care, I felt extremely confident. Their multi-modality approach allows me to get everything I need, under one roof. They scheduled all my appointments needed for further tests. All I had to do was show up, and pay my co-pay. Insert my humor here. My deductible was hit 9 days into 2018..Yippie!!! The Lynn Cancer Institute at the Sandler Building is a place like no other, and I truly hope you never have to see the inside. However, to understand the serenity of this place and in good humor, when the nurse walked me back to the women’s locker room to change for my second round of an ultrasound, I felt so good that I took off all my clothes except my underwear. When I went into the waiting area I looked around quickly thought OUT loud, “Ok Tara, this is not a SPA you can put your pants back on!” These tests were completed to rule out any cancer spreading into my right breast. I am so proud of myself for sharing my experience. The main reason I am doing this is to help awareness and to make sure everyone checks their boobies! 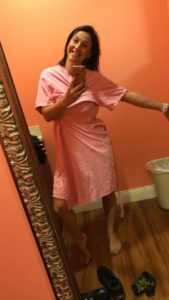 Since I have been sharing my journey, I cannot tell you how many people have told me they have scheduled or are going to get a mammogram for the first time! Thank you for letting me inspire you and for taking action of getting yourself checked. Please comment below or contact me how I can help if you don’t know where to start. There is a social media campaign #feelitonthefirst which is another great source that will help keep us women accountable to knowing our body. Thank you for sharing your story- you definitely are going to kick the s@&t out of BC. I just finished reading Tara’s opening remarks of “I’ve Got To Get These Off My Chest” and I thought “wow, pretty, smart and funny! “ I also realized that she IS as special as I thought she was when I first met her fresh out of college. I will continue to follow her journey with love for her and her beautiful family, and respect for her courage and her ever present positive outlook.